Smooth shifting is key to a smooth ride, and the quality of your inner and outer cabling can make as much of a difference as good quality shifters and derailleurs. 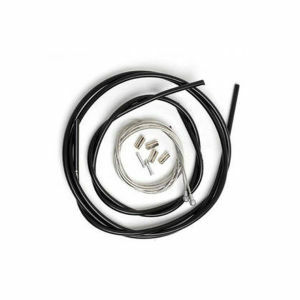 Achieve the smoothest shifting yet with this complete gear cable set from Shimano. Designed for top-end Dura-Ace 9000 mechanical shifting, these cables will enhance any Shimano shifting system. Complete top-of-the-range gear cable set designed to suit Dura-Ace 9000 gears. Includes 1.2 mm Polymer coated inner wires (1 x 2100 mm, 1 x 1800 mm), and SP41 outer casing for a complete bike (1 x 1700 mm), and all end caps. Polymer coated stainless steel inner wire leaves a smooth surface for low friction and reduced sliding resistance providing a lighter quicker shifting operation. SP 41 outer casing uses a special directional wound construction process makes for an axially stiff cable that transmits shifting movements accurately and quickly.